Last week a group of high school students from Royal High School visited Oracle Headquarters in Redwood Shores, California. Royal High School, a public school in Simi Valley, California, is launching an International Business Pathway program. This program is part of California’s Career Pathways Trust (CCPT), which was established in 2013 by the California State Legislature to better prepare students for the 21st Century workplace. The goal of the visit was to introduce students to real life examples of what they will be studying in the year ahead, which include Business Organization and Environment, Marketing, Human Resources, Operations, and Finance. 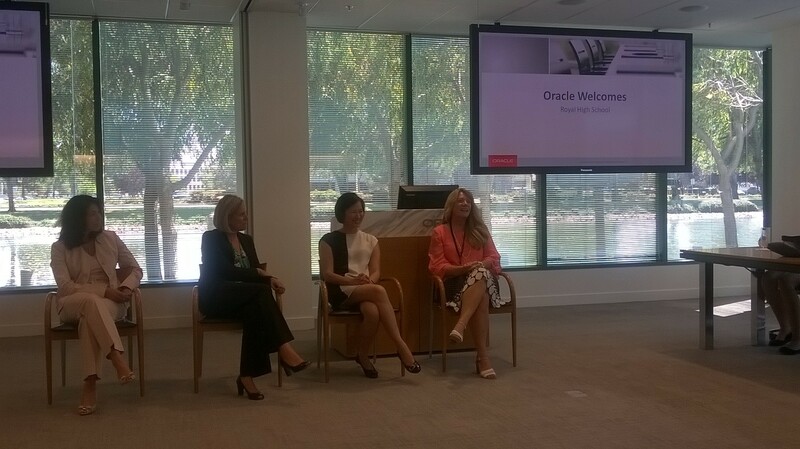 I was honored to be invited to be on a career panel with three other Oracle colleagues and share our different careers and career paths. While Oracle is known as a technology company, it is comprised of many different functional areas beyond engineering. The panel shared our diverse backgrounds and education, our different roles within the organization, the different cultures within Oracle, and more. Since these are students in an international business program, we also discussed Oracle as a global business. The panelists shared our individual involvement and impact on Oracle’s international business – from working with Oracle colleagues located throughout the world to engaging with global customers, partners, and journalists. By the end, the students heard stories of our professional and personal journeys to where we are now. The common themes were to be authentic and true to yourself, change is inevitable, and it is a lifetime of learning. All of the panelists started on one path but ultimately found new interests and directions. The students learned there are many different opportunities in companies and many different paths to achieve career and life goals. Bring your passion to work and you’ll succeed. On a personal note, I grew up in the same area as these students, that being the San Fernando Valley in Southern California. I moved from the San Fernando Valley to the Silicon Valley years ago, but thanks to Oracle Giving, I am able to give back to my roots and proud to participant in Oracle’s community outreach .